George Herriman’s titanic, masterful newspaper comic strip Krazy Kat is revered for the Sunday pages that he produced for 28 years, all now reprinted in thirteen volumes of Krazy & Ignatz. The daily strips are far less well known, as very little of that material has so far been collected. 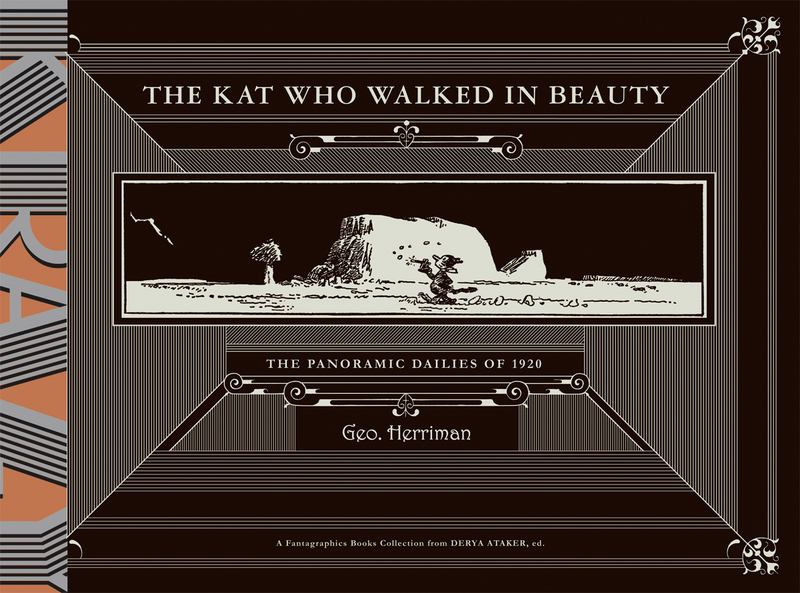 Herriman’s visual experimentation was restrained by the daily format, but he still produced some quite spectacular stretches of art and story, and The Kat Who Walked In Beauty collects a selection of rare dailies from 1911 to 1921. 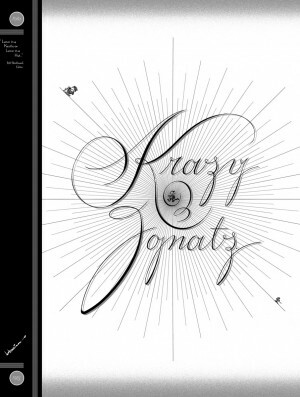 The design of this hardcover collection is spectacular. The silvery metallic ink debossed onto a cloth cover looks very impressive, and this is an enormous book: when opened, a spread measures almost two and a half feet wide! 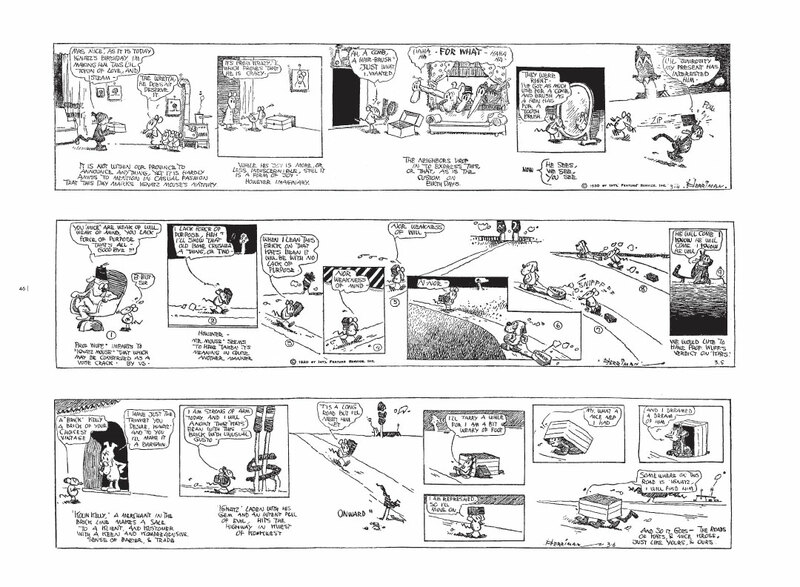 The landscape orientation allows the strips to be reproduced the same size as they originally appeared in newspapers, so the big panels are large enough to really appreciate all the detail of Herriman’s artwork, which was shown in Krazy & Ignatz at half size or smaller. There are three sections. ‘The Emancipated Kat’ shows selected early strips from The Dingbat Family period, featuring a very different Kat and mouse, in vertical panels. ‘The Liberated Kat’ features selections from The Family Upstairs period of 1914 when Herriman began a solo strip with Krazy as its star. The heart of the collection is ‘The Panoramic Dailies of 1920’ referred to on the cover; a nine-month stretch of daily strips, never reprinted before. 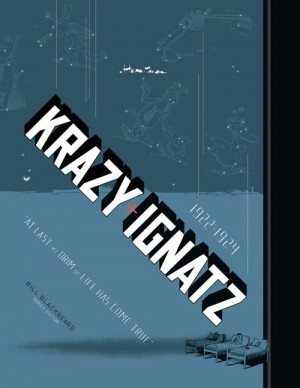 These are as captivating as any of the Sunday pages, with all kinds of visual devices augmenting the typical pun-filled, alliterative speeches and activities of Krazy, Ignatz and the rest of the inhabitants of Coconino County. 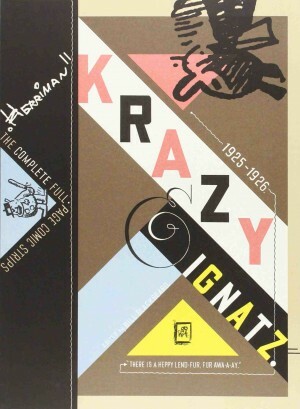 A final treasure included in this collection are all the program illustrations from the ‘jazz pantomime’ ballet described in Krazy & Ignatz 1922-1924. The ballet, devised by composer John Alden Carpenter, premiered in New York and was performed four times to sold-out houses and rave reviews. It did little to increase interest in the strip, but Herriman was happy with the result. His pictures for the program booklet, fifteen large cartoons with captions, plus cover, are reproduced here along with Carpenter’s introductory text explaining the ballet. 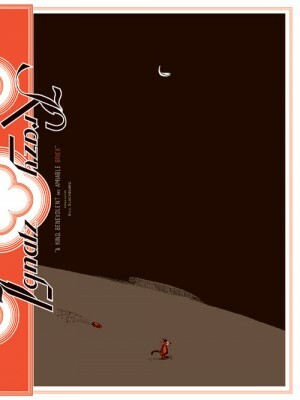 The Kat Who Walked In Beauty is a marvellous voyage of rediscovery into the work of a comics master, gorgeously designed by Jacob Covey and excellently presented in a huge sumptuous hardcover. Anyone interested in the history of newspaper comics should take a look.